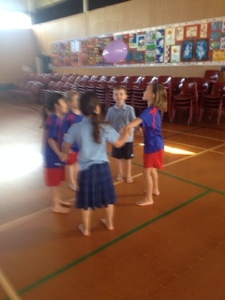 Room 20 @Sunnyhills: Kiwi sports on Thursdays with Mrs Grant! 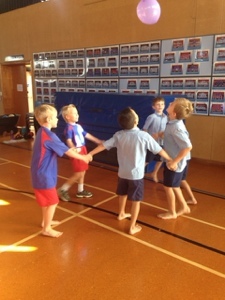 Learning to work as a team and letting each person have a go is really important in Team 20! How long do you think each team could keep the balloon off the ground AND still hold hands?? Try it as a family at home! (Sorry my photos are a bit blurry but it's hard to keep still in this challenge)! This looks like a whole lot of fun Room 20! 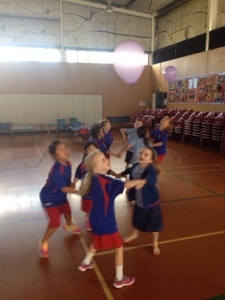 Which team had the best team work and kept the balloon up the longest? 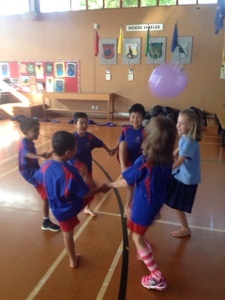 It looks like you are all trying very hard to keep the balloon in the air, we are also working on our teamwork and how we communicate. I wonder if we could have a competition between our classes to see what group can keep their baloon up the longest. Well Room 14 challenged us and we accepted! Today we had our faceoff! It was a great contest with lots of laughs, screams, shouts and everyone tried their hardest! R14 had a team that concentrated so hard on working as a tight knit team and they won! Congratulations! A lot of nose and foot work! !